Duke it out with the Boy Wonder! Highly detailed, 10-inch tall statue of Burt Ward as Robin. Based on the classic Batman TV series. Limited edition sculpted by Jean St. Jean! Based on the classic Batman TV series, this highly detailed resin statue is sculpted by Jean St. Jean! It depicts actor Burt Ward as Robin, Batman's partner in crime fighting. 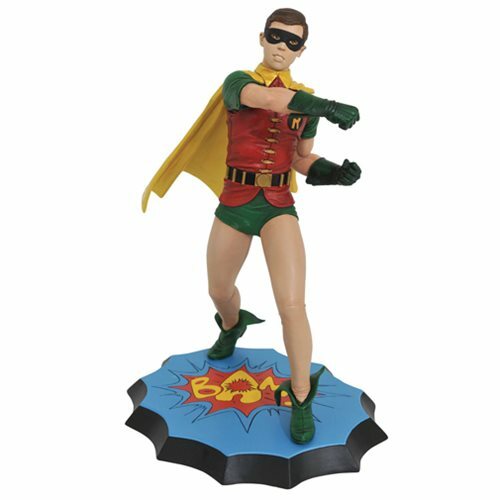 Measuring approximately 10-inches tall and standing atop a sound-effect base inspired by the show, the Batman 1966 Premier Collection Robin Statue is in scale with the other statues in the series (sold separately). Pair it with the Batman statue to throw a double punch at your collection! A limited edition of only 1,966 pieces, the Boy Wonder comes packaged in a full-color box with a hand-numbered certificate of authenticity.